Apple is planning to develop a self-driving shuttle service that will transport Apple employees from one building to another as part of its autonomous vehicle efforts, reports The New York Times in a piece that explores why Apple scaled back its car ambitions. Apple's "open secret" car project shifted focus from a full autonomous vehicle to an autonomous driving system last year, and to test that system, Apple will reportedly use employee shuttles. Called "PAIL," an acronym for "Palo Alto to Infinite Loop," the shuttle program will transport employees between Apple's myriad offices in Silicon Valley. Apple is said to be planning to use a commercial vehicle "from an automaker" paired with its own autonomous driving technology for the shuttles. Five Apple employees familiar with Apple's car project spoke to The New York Times about the shuttle program and also shared some details about the technologies Apple explored before the project was downscaled from car to software. When Apple first started exploring car technology under the "Project Titan" name, it hired hundreds of people with expertise in everything from automation to car manufacturing. The team explored a wide range of technologies, including silent motorized doors, car interiors sans steering wheel or gas pedals, augmented reality displays, an improved LIDAR sensor that protrudes less from the top of a car, and spherical wheels. Apple even looked into reinventing the wheel. A team within Titan investigated the possibility of using spherical wheels -- round like a globe -- instead of the traditional, round ones, because spherical wheels could allow the car better lateral movement. As has been previously reported, Apple's car project suffered from delays, internal strife, and leadership issues. According to the people who spoke to The New York Times, there was no clear vision for the Apple Car and there were internal disagreements over whether Apple should pursue an autonomous vehicle or a semiautonomous vehicle and what language should be used for the CarOS software (Swift or C++). Steve Zadesky, who initially led Project Titan but stepped down in early 2016, pushed for a semiautonomous vehicle, while Jony Ive's industrial design team wanted an autonomous vehicle that would "allow the company to reimagine the automobile experience." Bob Mansfield took over the car project in mid-2016, and the project shifted from vehicle to software. Many members of the hardware team were laid off, but morale is said to have improved under his leadership now that Apple has a clear focus on an autonomous driving system. 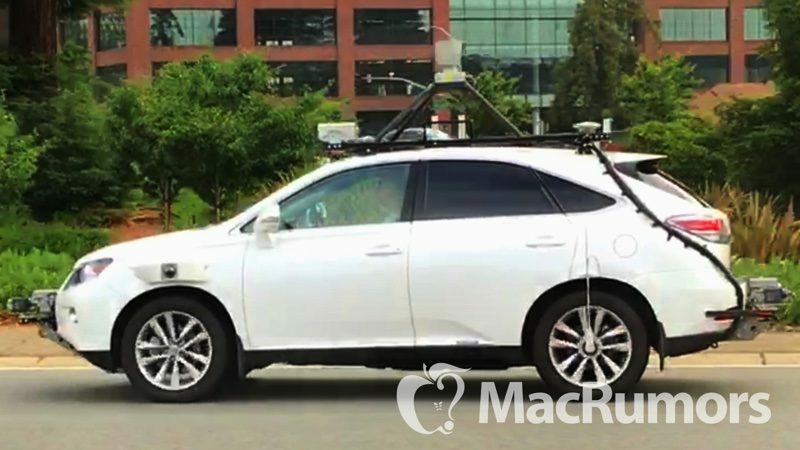 Apple is now far enough along in its software development that the company is testing it in several 2015 Lexus RX450h vehicles equipped with a host of sensors and cameras. The vehicles have been out on the roads in the Cupertino area since April. It's not yet clear when Apple plans to expand that testing to encompass the campus shuttles. Back in June, Apple CEO Tim Cook spoke publicly about Apple's work on autonomous driving software in a rare candid moment. "We're focusing on autonomous systems. It's a core technology that we view as very important," he said. "We sort of see it as the mother of all AI projects. It's probably one of the most difficult AI projects actually to work on." I'm missing the whole point of self-driving cars. would benefit too, but I can't see why anyone from 16 to 60 is going to want to be driven around. Driving is fun. It's freedom. Owning a unique car is great. Ever go to a car show? I don't understand why all the investment not only of money, but in trying to convince the public that this is something we want. I mean, do we really? To me it's like someone trying to convince you to stop using the potty, and go back to wearing diapers. You're right, you are completely missing the point. Humans are generally sh*tty at driving. Our attention is easily distracted. We easily miss things in the environment and kill or maim others. Most people are not driving around for fun. They are driving to get to work or run errands or something else just as mundane. Most traffic jams could be avoided by better more cooperative driving. Mass transit is certainly one solution that many countries do much better than US. Pay more taxes to spend billions on infrastructure for more mass transit would still not result in a car culture changing. Change the car instead. "Nearly 1.3 million people die in road crashes each year, on average 3,287 deaths a day. An additional 20-50 million are injured or disabled. More than half of all road traffic deaths occur among young adults ages 15-44"
It's more like putting diapers on you because you only think you are potty trained. Besides that, when you are that aging person that has their car taken away from them and becomes dependent on others for your mobility, crow about your freedom then. "Apple even looked into reinventing the wheel. A team within Titan investigated the possibility of using spherical wheels -- round like a globe -- instead of the traditional, round ones, because spherical wheels could allow the car better lateral movement." So the team were totally unaware at all about this concept from Goodyear shown to the public a year and a half ago ? How many billions of dollars have or will be wasted on this crap? So this is some of Timmy's "Magical Pipeline'? As the years roll on it looks like his pipeline is filled with garbage and hot air. What would happen when reach 88 miles per hour? No. Not the steering wheel. The 4 wheels of the car would have been spheres and would allow the car to go sideways. That would make parallel parking a breeze. Spherical wheels would make lateral movement easier at 60 MPH as well. What do they mean "allow for better lateral movements"? Like to turn left you just push to the left of the sphere?